The Massoth eMOTION 8FS decoder is a small decoder, featuring 8 function outputs with a total combined load capacity of 500mA. 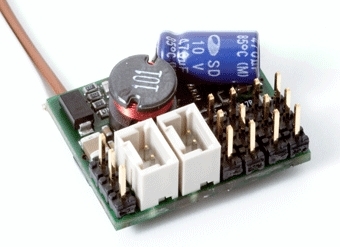 It has an integrated 5.5V voltage regulator for servo operations. It can handle servos, Massoth motor drives, Massoth uncouplers, light bulbs, and LEDs. Light and function outputs are dimmable and can be activated in analog mode. The 8FS features 6 programmable function outputs for servo control, 2 of which are high resolution. Standard and precision servo push button operations as well as servo operations with speed steps are possible. The Massoth eMOTION 8FS decoder is compatible with NMRA DCC. The 8FS features 2 function outputs that are specifically designed for control of Massoth automatic uncouplers. The 3-pin plug attached to the uncouplers plug directly into the socket associated with these outputs. The 2 outputs may also be used to control standard functions and servos. The eMOTION 8 FL Function Decoder is small enough for easy installation in locomotives, cars, and buildings.